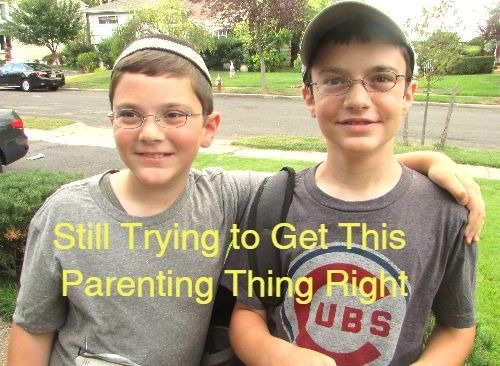 Why You Still Can’t Get Parenting Right. How many times have you heard practice makes perfect? About a gazillion – right. And I find it be true for the most part. Well, I might not get to perfect, but I get way, way better. Next week BR will be 14. Whoa – had a stop there for a moment. That still surprises me. Anyway, that means I will have been a parent for 122,640 hours. Way more than the 10,000 hour rule. By the way, this doesn’t even count the hours with SJ who will be 11.5 in a couple of weeks. Do we get double time? Just wondering. So, the 10,000 hour rule. You know it – right? Takes 10,000 hours of deliberate practice to become great at some high level task. While this is an average and is task dependent, the point is it takes a long time to get to be great at something. Wouldn’t you say 122,640 hours is a long time? So, all of us who have teenagers and beyond should be parenting masters? Any of you feel like your parenting masters? Gurus? Wizards? Experts? I’d settle for pretty good. Some days I’d take not awful. Some issues – we really should be past already. Put their shoes on the bench. Uggh!!! This petty crap is so annoying. There has to be a better way. So, why haven’t I figured it out yet? Why aren’t I a parenting expert who knows just what to say to make these minor things happen? Yes, I know these are the little things. There are bigger things that I struggle with when it comes to my boys. Thankfully, nothing huge. But still, they’re at the age where I can’t reveal everything in this public forum. Now, they have opinions and articulate them. Plus, they and their friends are online ALL THE TIME! So, I’ll have to talk in vagaries. Remember when your children were young. They were crying or wining over something minor and you were frustrated as heck. Somehow a parent of older children would always appear out of nowhere and say, “Little kids, little problems. Big kids, big problems.” And you smiled wanly though in reality you wanted to scream shut up and smack ’em. My children do not have such big problems. They go to school, do their homework (thank you Mrs. MMK), and stay out trouble 99.8 percent of the time. I’m proud of them and feel fortunate. Yet, there are challenges and struggles when it comes to parenting. Sometimes it’s as if we are talking different languages. Despite my wisdom, patience, decency, and best efforts, they disagree, argue, and ignore. Heck, sometimes, they can be annoyed at everything. They can argue over every little thing. They can be certain they are right even when they make no sense. So, why can’t I get this parenting thing right? Why can’t I let go what should be let go? Why can’t I guide my children when they are in need of guidance? Shouldn’t we able to hash through disagreements and come to an understanding sans yelling, threats, slammed doors, etc.? According to this article by Dr. Kenneth Ginsburg in Psychology Today, “Many struggles of adolescence occur because we parents are conflicted about our children growing up.” He goes on to say part of us parents wants to keep our children small and dependent, and that comes out of love. There’s more to it than that, but you get the idea. I’m fine with my children growing up. As long as they do it right. I’m kidding – pretty much. I know my children are developing, testing boundaries, etc. I know they won’t always do things the way I would have them do it. I know I have to let them make mistakes. I’m trying. I really am. I also know that as I get better at this stage of parenting, they’ll just change on me again. Then, I’ll have to figure out how to be a parent at a new stage. So, why can’t we get parenting right? Cause this job means raising people. And they constantly change. Plus, there’s no instructions. This entry was posted in Family and tagged parenting by lardavbern. Bookmark the permalink.